KATHMANDU, Nepal (AP) — "I say again, turn!" the air traffic controller called over the radio, his voice rising, as the flight from Bangladesh swerved low over the runway at Kathmandu's small airport. Seconds later, the plane crashed into a field beside the runway, erupting in flames and leaving 49 of the 71 people on board dead. That moment Monday appeared to result from minutes of confused chatter between the control tower and the pilot of the US-Bangla passenger plane, as they discussed which direction the pilot should use to land on the airport's single runway. A separate radio conversation between the tower and at least one Nepali pilot reflected the sense of miscommunication. "They appear to be extremely disoriented," a man said in Nepali, watching as Flight BS211 made its approach, though it was not clear if the voice belonged to a pilot or the tower. "Looks like they are really confused," said another man. In the recording, posted by air traffic monitoring website liveatc.net, the pilot and the tower shifted back and forth about whether the pilot should approach the runway from the north or the south. Just before landing, the pilot asked, "Are we cleared to land?" Moments later, the controller came back on the air, his voice clearly anxious, and told the pilot, "I say again, turn!" Seconds after that, the controller ordered firetrucks onto the runway. The plane, which was heading from Bangladesh's capital, Dhaka, to Kathmandu, was carrying 67 passengers and four crew members. 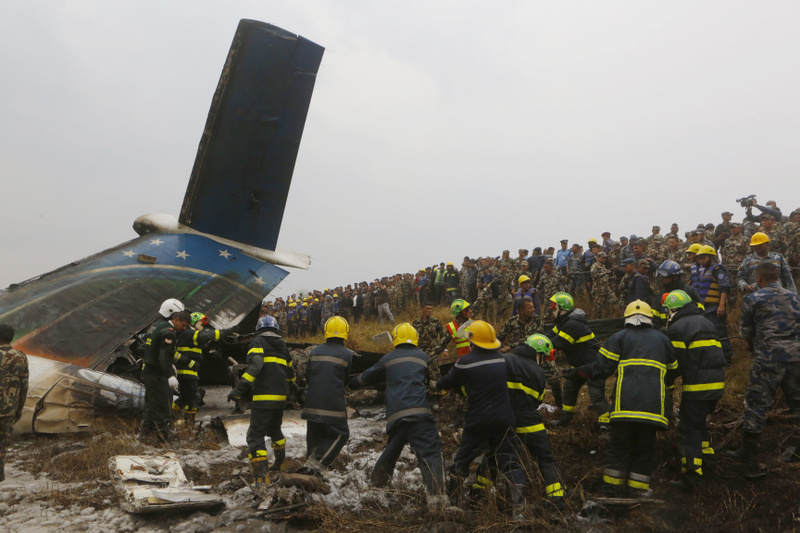 Kathmandu officials and the airline laid the blame for the accident on each other. The airport's general manager told reporters Monday that the pilot did not follow the control tower's instructions and approached the runway from the wrong direction. "The airplane was not properly aligned with the runway. The tower repeatedly asked if the pilot was OK and the reply was 'Yes,'" said the general manager, Raj Kumar Chetri. But Imran Asif, CEO of US-Bangla Airlines, told reporters in Dhaka that "we cannot claim this definitely at the moment, but we are suspecting that the Kathmandu air traffic control tower might have misled our pilots to land on the wrong runway." After hearing the recording between the tower and the pilots, "we assumed that there was no negligence by our pilots," he said. He said the pilot, Capt. Abid Sultan, was a former air force officer and had flown the Bombardier Q400 series aircraft for more than 1,700 hours and was also a flying instructor with the airline. While officials in Bangladesh said the pilot had died from his injuries Tuesday, raising the death toll to 50 people, Nepal police spokesman Manoj Neupane later said that was wrong, and the death toll remained at 49. The injured were being treated in various hospitals in Kathmandu, Nepal's capital. Autopsies on the dead were being performed at the Kathmandu Medical College and Teaching Hospital morgue, where some 200 relatives waited to hear about their loved ones. Dr. M.A. Ansari of the hospital's forensic department said identifying all the dead could take as long as a week because many of the bodies were badly burned. By late Tuesday morning, four bodies had been identified. Anita Bajacharya waited at the hospital with her parents and other relatives for details on her 23-year-old sister, a medical student who had just finished school in Bangladesh and was returning home on the flight. The sister, Asma Shakya, had called her mother from the airport, excited about returning home. Now her family sat outside a hospital waiting for her body to be identified. Relatives of the passengers from Bangladesh arrived in Kathmandu late Tuesday afternoon and were escorted to the hospital by airline officials. 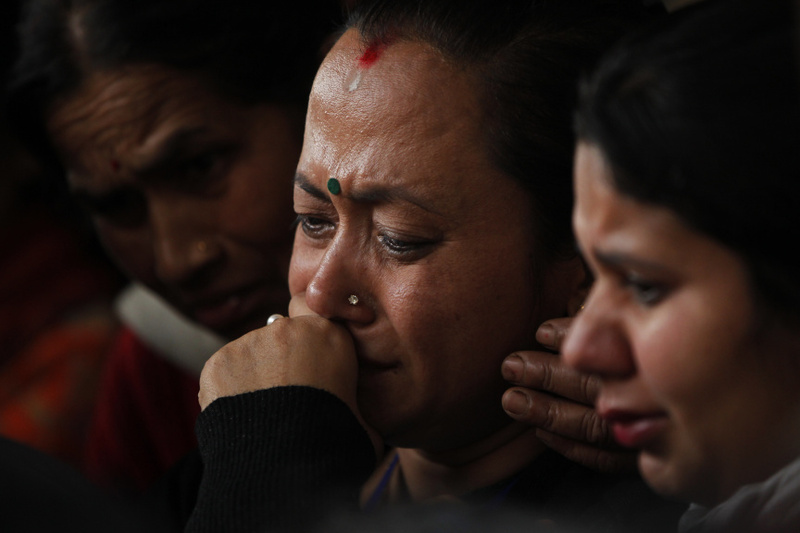 Nepal's government has ordered an investigation into the crash. However, Mohammed Kamrul Islam, a spokesman for US-Bangla Airlines, said the governments of both Nepal and Bangladesh need to "launch a fair investigation and find the reason behind the accident." According to the airline, the plane was carrying 32 passengers from Bangladesh, 33 from Nepal and one each from China and the Maldives. It did not provide the nationalities of the four crew members. US-Bangla operates Boeing 737-800 and smaller Bombardier Dash 8 planes, including the Q400, the model that crashed. The airline is based in Bangladesh's capital, Dhaka, and flies domestically and internationally. The parent company, part of US-Bangla Group, is also involved in real estate, education and agriculture. Kathmandu's airport has been the site of several deadly crashes. In September 2012, a Sita Air turboprop plane carrying trekkers to Mount Everest hit a bird and crashed shortly after takeoff, killing all 19 people on board.